Nature gives us plenty of practical uses for banana peels. They serve so many practical purposes throughout the households, that it is a shame to put a peel in the trash. Landfills are full enough, something that composts naturally should stay out. Here are some basic uses for banana peels that you might not have considered. You will think twice before throwing away a banana peel again. 1. They serve as an acne treatmentOne common method for ridding yourself of unwanted acne is to rub a banana peel with honey on your face. The combination of the antibacterial properties and the honey and the peel make for a great cleanser. 2. Protection from the sunIf you spend a lot of time in the sun, the ultraviolent rays could cause cataracts. Applying a banana peel to the eyes can help this condition. 3. Cleaning propertiesThere are surprising cleaning aspects to a banana peel. Use it to clean off dirty shoes or jewelry. 4. Deterring wrinklesThe natural substances in banana peels produce antioxidants. These can be beneficial to the skin. Applying a banana peel to your face may seem like a strange idea, but it can go a long way towards skin health. 5. The kitchenThere are plenty of recipes that use banana peels. They would certainly be better served in your stomach after a good meal. 6. Relief for bug bitesTake the interior of a banana peel and rub it against the bug bite. The properties of the peel neutralize the area, lessening the itch. 7. Keep warts at bayStrangely enough, banana peels are effective when it comes to removing and preventing warts. 8. Help psoriasis outbreaksPsoriasis can be soothed by banana peels. Just rub the peel on and notice the relief that it brings. 9. Ease aches and creaksSometimes your body is feeling achy. 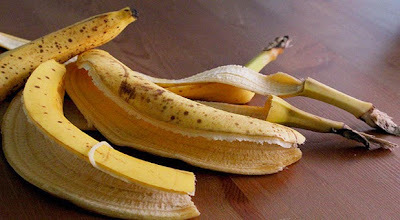 Banana peels as an essential oil can help to smooth aches and pains, just rub the oil on the sore spot. 10. Whiten your teethBanana peels can help to whiten your teeth. Just rub the inner part of the peel against your teeth for a week or two. You should notice the whitening properties.